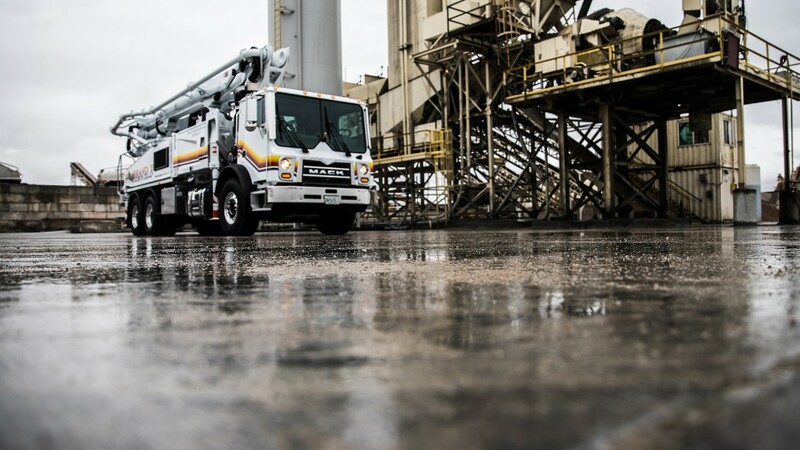 Mack Trucks will equip Mack TerraPro® concrete pumper models with the Mack® mDRIVE™ HD automated manual transmission (AMT), marking the first time an AMT has been available in a cabover concrete pumper. "The mDRIVE HD is the only AMT available with split-shaft PTO functionality, which enables us to offer concrete pumper customers all the benefits of the mDRIVE HD and our fully integrated powertrain," said John Walsh, vice president of marketing for Mack Trucks. "In addition to improved performance and productivity, the mDRIVE HD helps increase jobsite safety. Eliminating traditional shifting allows drivers to focus on safely operating their equipment." The Mack mDRIVE HD is fully integrated with Mack's legendary engines and axles, providing additional performance and efficiency benefits for customers. In TerraPro concrete pumpers, the mDRIVE HD will be paired exclusively with the 11-litre Mack MP7 engine, and will be available with higher horsepower and torque ratings than equivalent models with conventional automatic transmissions. That includes the MP7's top rating of 425 horsepower and 1,560 lb.-ft. of torque, which packs 13-litre power in an 11-litre engine. The mDRIVE HD for TerraPro concrete pumper models is available as a 13-speed direct drive or overdrive, as well as a 14-speed direct drive. "For more than 100 years, Mack has held firm to the belief that components designed work together simply work better," said Tim Wrinkle, Mack construction product manager. "Not only do our integrated components deliver higher performance, they also help maximize uptime for our customers." Like all Mack mDRIVE AMTs, the mDRIVE HD in TerraPro concrete pumper customers will be monitored by Mack's GuardDog Connect telematics solution. GuardDog Connect, which comes standard on all Mack models powered by Mack engines, provides proactive monitoring and repair planning, real-time diagnosis of issues, repair scheduling and confirmation that needed parts are in stock and ready to install. Together with Mack ASIST and Mack's OneCall uptime experts, GuardDog Connect delivers decision-critical information to maximize customer uptime. Mack's mDRIVE HD is based on the proven design of the mDRIVE, which has been standard in Mack highway models since 2014. With ruggedized internal components, including stronger gears and synchros, the mDRIVE HD is built to withstand the frequent shifting often found in construction applications. The 13- and 14-speed variants also feature low-ratio creeper gears, enabling the mDRIVE HD improved startability and ultra-low speed maneuverability. As the only AMT with split-shaft PTO functionality, the mDRIVE HD gives concrete pumper customers improved performance, proven durability and maximized uptime in an easy- to-use package.